GEOGRAPHIC LOCATION On the hills of the Sienese countryside, a short distance from the medieval town of San Gimignano, a splendid medieval abbey converted into a luxury 20-key boutique hotel with Italian garden and fully equipped swimming pool. The hotel, currently in operation, is located just 3km from San Gimignano and is located in an extremely convenient position that allows you to move easily throughout Tuscany and its most beautiful centers: the fortified village Monteriggioni (27km; 40’), the Etruscan Volterra (29km; 35’), San Casciano in Val di Pesa (41km; 40’), the medieval center of Siena (49km; 55’), the Renaissance city of Florence (60km; 1h 15’), Pisa with the famous leaning tower (75km; 1h 20’), Lucca (81km; 1h 35’), Montepulciano (103km; 1h 35’), Grosseto (113km; 1h 40’) and the splendid Follonica (121km; 1h 50’) . The most convenient airports to reach the property are Florence Peretola (70km; 1h 5’), Pisa Galilei (72km; 1h 5’), Bologna Marconi (151km; 1h 55’), Perugia Sant’Egidio (157km; 2h 5’) , Rome Ciampino (285km; 3h 10’), Rome Fiumicino (300km; 3h 15’), Milan Linate (348km; 3h 35’) and Milan Malpensa (401km; 4h 10’). DESCRIPTION OF THE BUILDINGS The master villa (1,820 sqm – 19,583 sqft, 16 bedrooms and 26 bathrooms) is the result of the restoration of the old convent and is today a splendid boutique hotel. On the ground floor we find the common rooms of the structure, including three large dining rooms (one of which obtained in the church of the complex, now deconsecrated) with professional kitchen, the hotel lobby with reception, an office and several toilets. Going up to the first floor we find the section for guests with 15 bedrooms, all equipped with en-suite bathroom. Finally, the tower hosts magnificent suite with a bathroom and a relaxation area with a whirlpool bath. At the center of the structure there is a wonderful arcaded cloister and, in the middle of this, a well. Just below, accessible from inside the hotel is the cellar of the complex, built within an ancient water cistern. Outside the hotel there is also a breakfast room (66 sqm – 710 sqft) reserved for the guests of the structure. The guesthouse (188 sqm – 2,023 sqft, 4 bedrooms and 4 bathrooms) is structured on two floors as follows: - Ground floor: two bedrooms and two bathrooms; - First floor: two bedrooms and two bathrooms. Below the annex and the hotel, which are therefore connected, there are many underground rooms (for a total of 1,104 sqm – 11,879 sqft) that include tool storage, refrigerating room for food, a gym equipped with changing rooms and showers, a local for loading/unloading goods and toilets for the employees of the structure. HISTORY, STATE AND FINISHES The main building, whose shape betrays the origins of the complex as a monastery, was erected in the last twenty years of the 16th century as a gift of the population to the monks who had helped the country in times of crisis. The convent was ultimately consecrated at the end of the century (1598–1599). With the arrival of the French army at the end of the 18th century the convent was abandoned until the 20th century when the property was finally bought by a noble and influential Florentine family. The structure is nowadays in excellent condition: the renovation was carried out with great care, using only original materials such as columns, stone frames and jambs. The chapel (with its sacristy) is no longer consecrated and has recently been transformed into a splendid restaurant. The tower, a prominent element of the property, now houses a beautiful suite with bathroom and whirlpool. 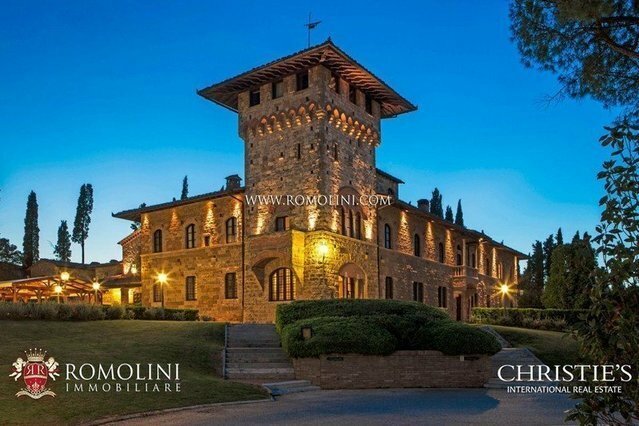 From the windows, you have a direct view of the famous towers of San Gimignano. EXTERNAL AREA The villa is set in a well-kept park of 2.5 hectares, entirely surrounded by a stone wall. The Italian garden of the complex was designed by a student of the famous landscape architect Pietro Porcinai. Moving away from the buildings we find an English park dotted with cypress and oak trees and the swimming pool of the property (16 x 6 m), equipped with solarium and bar area. USE AND POTENTIALITY The complex, of considerable historical and architectural value, is currently used as an accommodation business with the formula of the boutique hotel. The beautiful geographical location, close to the most beautiful cities in Tuscany, also contributes to make the structure particularly suitable for accommodation. It is always possible to reconvert the building into a private residence.